In a broad sense, there is little to get excited about. The S&P 500 has had a dismal performance since 1997, and current trends in both monetary and fiscal policy make most investors want to sit and hang their head. With such an uncertain future for both the USA, and the world, there seems to be fewer and fewer attractive alternatives. Gold? The S&P 500? Foreign Currencies? Corporate Bonds? TIPS? Real Estate? Foreign Equities?…The hole in the back yard? I find my self routinely going through “The Best – Of the Worst List” in my head. Starting from there, and looking around a bit, I stumbled across Congressional Effect Management, the company that manages the Congressional Effect Fund, a mutual fund run by Eric Singer. The Congressional Effect Fund (CEFFX) is a no-load fund with a low minimum initial investment, a higher than average annual fee, and surprisingly good performance. Naturally, Congressional Effect Management is based upon the premise of the Congressional Effect, which basically says: “The stock market preforms better when congress is not in session.” This phenomenon was originally profiled in a 1992 Barron‘s article. Once more, the relationships held, with the S&P 500 up a daily average of .00036% when Congress was open, vs. .00066% when Congress was out of town. The trend has intensified in recent years right along with government growth. From 2000 through 2008, the in-session annualized daily performance of the S&P 500 was a negative 12.4 percent. The out-of-session performance: positive 8.8 percent. In other words, had you invested $10,000 only when Congress was in session from the beginning of 2000 through 2008, excluding dividends, you would have $4,615. Had you invested that same $10,000 only on days when Congress was on vacation, you’d have $13,416. Simply, the Congressional Effect Fund invests in the S&P 500 when Congress is out of session, and sells its position, buying domestic interest bearing securities, when Congress goes back into session. The fund is listed as one of “The 10 Strangest Mutual Funds,” naturally. 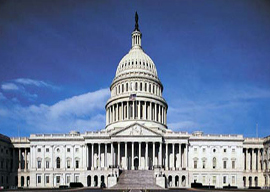 Having the strategy that is does, Congressional Effect Management aligns itself with similar organizations. To my pleasure, the fund lists such organizations at the Cato Institute, the American Enterprise Institute, The Heritage Foundation, and the Ludwig von Mises Institute under their “Friends of Freedom“ page.